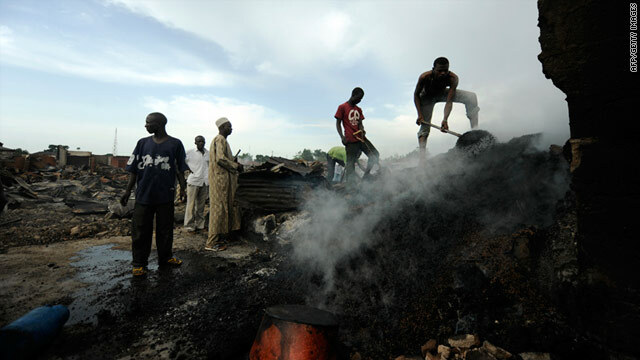 Deadly violence, such as this arson attack in Kaduna, has swept across northern Nigeria in the wake of the country's elections. Borno, Nigeria (CNN) -- Nigeria will proceed with national gubernatorial elections Tuesday, despite continuing violence that has raised fears that an Islamist group will step up attacks against voters. Bomb blasts Monday in Nigeria's northeastern state of Borno killed three people and wounded dozens, police said. In one of three blasts, a bomb thrown from a motorcycle on which two young men were riding detonated, resulting in the three fatalities, said Michael Zukoma, police commissioner for Borno state. Nigerian police told CNN that Boko Haram, an Islamist sect that has challenged Nigeria's government, is responsible for the attacks, which they described as an attempt to intimidate voters who this month re-elected President Goodluck Jonathan, an Ijaw Christian from the south. The explosions occurred a day after the Nigerian Red Cross reported that rural villages had held mass burials in northern Nigeria. Witnesses say that violence in the wake of Jonathan's election has resulted in hundreds of deaths, though there is no official death toll. The government has provided few details. This month's election of Jonathan, who is from the majority-Christian southern part of the country, sparked violence in the Muslim-dominated north last week. Concerns about ongoing violence led Nigerian election officials last week to delay the planned gubernatorial elections in two of Nigeria's 36 states. Voters in Kaduna and Bauchi states will go to the polls Thursday. Northern Muslims in some areas charged that the presidential election was rigged. Armed protesters in the region took to the streets chanting the name of former military ruler Muhammadu Buhari, the main opposition front-runner. The last election, four years ago, was widely condemned for rampant vote rigging, violence, theft of ballot boxes and intimidation. While this month's presidential election was marred by violence, reports of underage voting and logistical problems, observers said they considered it an improvement. After he was declared the victor, Jonathan warned that persistent post-election violence could threaten the stability of the country. "These acts of mayhem are sad reminders of the events which plunged our country into 30 months of an unfortunate civil war," Jonathan said last week. Jonathan was referring to a period of unrest in the 1960s that spawned a civil war in Nigeria. Nigeria is Africa's largest oil producer and its most populous nation, with 150 million people.